The 7th Congress of the Workers’ Party of Korea in 2016: Return to a “New Normal” or Risk a “Take-Off”? On October 30, 2015, North Korean media including the Korea Central News Agency (KCNA) announced that in early May 2016, the 7th Congress of the Workers’ Party of Korea (WPK, or simply the Party) will be convened. For a socialist country, a Party Congress should be a routine event; decades ago it was, more or less, also for North Korea. The first Congress of the WPK was held in 1946. The next such meetings followed in 1948, 1956, 1961, and 1970. But the so far last 6th WPK Congress was convened in 1980—at a time when most of the currently active North Korea watchers were either teenagers or not yet even born. The announcement of the 7th WPK congress after a hiatus of more than three decades is therefore big news by itself. The question is: why, and why now? The North Korean state has been somewhat parsimonious with clear explanations. So far, it has only announced that the Party Congress would be convened next May upon decision by the WPK Politburo. We are therefore, again, left to speculate. But considering that North Korea is, directly or indirectly, one of the biggest security challenges in Northeast Asia, and having the UN’s devastating report on North Korean human rights in mind, it is important that we start thinking about the potential outcome of the 7th WPK Congress even without having all the clues we need. Generally speaking, there are two main options for how the Congress will turn out: 1) The Congress could signal nothing but a return to a new normal and a continuation of the half-hearted strategy of adjusting the old system as witnessed in the past years; or 2) a major policy change will be announced, comparable to the 12th Congress of the Chinese Communist Party in 1982, the 27th Congress of the Communist Party of the Soviet Union in 1986, or the 6th National Congress of the Communist Party of Vietnam in the same year, and marking the departure down a path of true reform that will change the face of North Korea and of the region. For a socialist country, “normal” means a more systematic and structured rule by the Party. With some restrictions, we could argue that this was the case in North Korea until the collapse of the socialist block in the late 1980s. There are indications that North Korea is returning to this kind of normality. Kim Jong Un has already taken steps in that direction. His official debut to the world of North Korean politics took place in September 2010 during a Party Conference—the first in 44 years. Among the many things that happened during that meeting was the resuscitation of leading Party organs such as the Central Committee, the Politburo and its Presidium. The next Party Conference took place less than two years later in April 2012. It has so far been the last “mega-event” of the WPK. 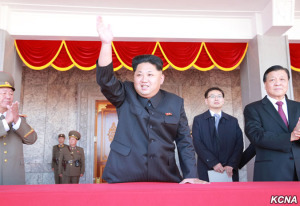 The main task of the April 2012 Party Conference was the formalization of Kim Jong Un’s succession. Resembling the declaration in 1998 of Kim Il Sung as the Eternal President of the country, Kim Jong Il was declared the Eternal General Secretary of the Party. The “only guiding idea of the party” was renamed into Kimilsungism-Kimjongilism. The post of First Secretary of the WPK was newly created and given to Kim Jong Un, who also became Chairman of the WPK’s Central Military Commission and a member of the Presidium of the Politburo of the WPK’s Central Committee. In March 2013, Kim Jong Un announced his byungjin (병진) policy of simultaneously pursuing economic development and nuclear defense. I have interpreted this as the de facto end of songun (선군), or military-first policy, because the military now had to share first place with the economy. One could thus argue that under Kim Jong Un, the formal role of the Party has been restored, step by step. From that perspective, holding a Party Congress is only consequential. It would issue statements on internal cohesion and monolithic unity, celebrate the status of the country as a nuclear and space power, reshuffle a few posts, glorify the three Kims, emphasize the need for Korean unification along the joint declarations of 2000 and 2007, and promise the Korean people happiness and prosperity. The next, 8th Congress would then take place in 2021. The other option would, in principle, follow what I was told by North Koreans in the past years when I asked about the outstanding 7th Party Congress: “We only hold such an event when something significant has happened and an important announcement will be made.” At first glance, this explanation sounds somewhat odd if we consider history. There would have been reasons galore for at least three Party Congresses, if not more. But the time was never deemed right by whoever was the leader in Pyongyang 1980-2015. After 1980, Kim Il Sung wanted to avoid an open debate on what had meanwhile happened in China, the Soviet Union, Vietnam, or Eastern Europe including Germany. Reform and opening, glasnost and perestroika, doi moi (renovation), or national unification after a peaceful anti-socialist revolution—these were too dangerous topics to be discussed publicly. When in July 1994 Kim Il Sung passed away, many thought that the time for the 7th Party Congress had finally come. What could have been more important than the enthronization of a new leader? But nothing happened. Perhaps it was the famine of the mid-1990s, euphemistically called the “arduous march” in North Korea, which kept Kim Jong Il from convening such a costly and festive event. Then came June 2000. The leaders of North and South Korea met for the first time ever. Tourism projects and a joint industrial zone near Kaesong were initiated, diplomatic relations with a large number of Western nations were opened in 2001, and in July 2002 the North Korean state decided on economic “measures.” The nature of North Korea had changed significantly. But these events, too, did not result in a Party Congress during which they could have been discussed and fit into the ideological framework. Perhaps it was the “War on Terror” that followed the 9/11 attacks that prevented the Party from convening a Congress in 2003. North Korea was identified as a member of the “axis of evil,” the nuclear issue resurfaced as a major bone of contention in foreign policy and in inter-Korean relations, and the positive development in relations with Western countries stopped. In 2003, the military-first policy gained prominence in North Korea’s propaganda. This was a major modification of the hitherto dominant juche (주체) ideology, but not even this step seems to have been significant enough in the eyes of the leader to convene a Party Congress—although the Party is the keeper of ideology. In 2006, North Korea conducted its first nuclear test. This was lauded by domestic propaganda as one of the biggest successes of all times, and it eventually even resulted in a change to the constitution. But again, no Party Congress to celebrate the achievement and to set the pace for the new, nuclear age. Then Kim Jong Il experienced health problems in 2008. Many North Korea watchers, including myself, had expected the 7th Party Congress to be the stage for the eventual announcement of a succession blueprint, be it in the form of a third Great Leader or by switching to collective leadership. But all Kim Jong Il could do was to convene a Party Conference in September 2010, during which his third son Kim Jong Un was officially introduced to the public. A year later, Kim Jong Il passed away without having resolved the succession issue explicitly. The Party stepped in as the kingmaker and declared Kim Jong Un to be the “great successor to the cause of juche” on December 19, 2011. To formalize this somewhat hasty succession, another Party Conference was held in April 2012—but again, not a Party Congress. Some of this seems to point more toward option 1, a return to a new normal, as discussed above. Too many occasions to make important announcements have passed unused. But even if we assume that the Party and its Congresses will now regain their functions in North Korea as these institutions have played in other socialist countries, then we should also remember that all major reforms of state socialism—be it in China under Deng Xiaoping, the Soviet Union under Gorbachev, or Vietnam under the slogan of doi moi—have been announced at such regular Party Congresses or related events. Is North Korea finally ready for its own venture towards a “socialism of our kind” that is more market-oriented, fosters private economic activity and embraces external economic cooperation? The official ideology would not stand in the way of such an endeavor: the central credo of juche that “man is master of everything” gives the leader the freedom to do whatever he deems right. Last but not least, Kim Jong Un has from day one of his leadership declared that he wants to improve the material living conditions of his people. He has tried to do that within the constraints of the existing system. I had estimated that he would need about five years to find out that this does not work, that the system itself is the problem. The time is almost up. We can’t look inside the North Korean leader’s head. Kim Jong Un might ignore that warning, play it safe and after having spent the last years cleaning the ranks of party, military and government, will use the 7th Party Congress for a triumphant declaration of his victory in the domestic struggle for power. The country would return to a new normal and continue to muddle through. But May 2016 would also be a good time for Kim Jong Un to lead his country on the path of gradual but real reform, a transition that would change North Korea the same way as this has happened in China and Vietnam, no matter how this would be framed ideologically. He could go down in history as the man who unleashed the vast economic potential of his country and turned it into the next East Asian dragon—the man who brought lasting peace to Korea and prosperity to his people. Regardless of what will actually happen: The 7th Party Congress of the WPK in May 2016 would be a perfect occasion to formally announce such a process. “조선로동당 중앙위원회 정치국 당 제7차대회를 소집할것을 결정,” www.kcna.kp, accessed November 1, 2015. A Party Congress (당대회) is, at least theoretically, a regular event that—before a 2010 amendment to the WPK statutes—was supposed to take place every five years. A Party Conference (당대표자회) is like an ad hoc Party Congress and is convened under extraordinary circumstances. The WPK has so far held four Party Conferences, in 1958, 1966, 2010 and 2012. Rudiger Frank: “Hu Jintao, Deng Xiaoping or Another Mao Zedong? Power Restructuring in North Korea,” 38 North, October 10, 2010, https://www.38north.org/2010/10/1451. Rudiger Frank: “Can North Korea Prioritize Nukes and the Economy at the Same Time?” Global Asia, Vol. 9, No. 1, Spring 2014, pp. 38-42, https://www.globalasia.org/wp-content/uploads/2014/03/552.pdf. Rudiger Frank: “Economic Reforms in North Korea (1998-2004): Systemic Restrictions, Quantitative Analysis, Ideological Background,” Journal of the Asia Pacific Economy, Vol. 10 (2005), No. 3, pp. 278-311. Rudiger Frank: “The Party as the Kingmaker: The Death of Kim Jong Il and its Consequences for North Korea,” 38 North, December 21, 2011, https://www.38north.org/2011/12/rfrank122111. Rudiger Frank: “North Korea after Kim Jong Il: The Kim Jong Un era and its challenges,” The Asia-Pacific Journal Vol. 10/2, January 9, 2012, http://japanfocus.org/-Ruediger-Frank/3674. This is at least the case judging by North Korean standards. Despite the still tense food situation, no major famine has been reported in the last decade. Foreign trade grows continuously, although dependency on China is massive. Energy supply recovers only slowly, but steadily due to the finalization of smaller and bigger projects like the Huichon Power station. Infrastructure is still a big problem, but new roads like the one from Rason to China were built, new harbors like the one in Tanchon or new airports like Kalma near Wonsan were opened, others like Sunan airport were substantially renovated, and railways like the one from Rason to Russia were modernized. Even entrepreneurship develops to new levels from being necessity-driven to being opportunity-driven, as a study by the South Korean Ministry of Unification confirms (Suk-Jin Kim and Moon-Soo Yang: The Growth of the Informal Economy in North Korea, KINU Study Series 15-02, Seoul: Korea Institute for National Unification, 2015).